My current activity started in a very minor way. I must thin out the Cyclamen hederafolium and nerines in the rockery, I thought yet again but this time I had my timing more or less right. The nerines look fantastic in flower in autumn but the clumps had become so large that they had forced themselves up out of the soil and the foliage hangs on right into late spring, swamping treasures around them. What I did not realise when I started was that the task was going to be so major that I would spend eight hours a day for several weeks, taking apart the contents of the rockery pocket by pocket. It has become a Major Mission. Cyclamen hederafolium is the autumn flowering species, formerly known as neapolitana. It is a gem which flowers over a period of months in white and, more commonly, cyclamen pink. After many years, decades even, they sure were overdue for thinning out. They grow from flattish, round corms and a large one is about 10cm across. Some of ours were closer to 25cm across and as I gently excavated, I found them up to three deep. In fact, my thinning exercise yielded up around 60 litres of surplus corms with which Mark plans to carpet woodland margins and add to his naturalised bulb hillside in the park. That is six 10 litre pots, in case you are wondering how I arrived at the 60 litre figure. Having started, I found that the English snowdrops and black mondo grass which share some of the same rockery pockets were also in desperate need of thinning. And while I was about it, I figured the heavily compacted soil could do with aeration and a light dressing of compost. Then the rocks needed some of the lichen and moss scraped off them and some of the pockets had soil levels which overflowed. In fact a complete spruce-up seemed in order. And of course the areas which I did looked so fresh and clean that I felt I had to continue. I am still not finished but I am a driven woman and will not desist until I have done the lot. I have uncovered rocks and divisions in the pocket beds that we did not even know existed. Rockeries are not in fashion these days, not at all. Ours is a 1950s style rockery using raised beds in island formation. There are a lot of rocks, brick and concrete in it and it must have been a major exercise to build. I had not noticed before that the largest rocks are in the beds closest to the drive. The further you go from the vehicle access, the smaller the rocks get and the more freeform concrete construction there is. I can understand why. Some of the largest rocks must have been very difficult to move. 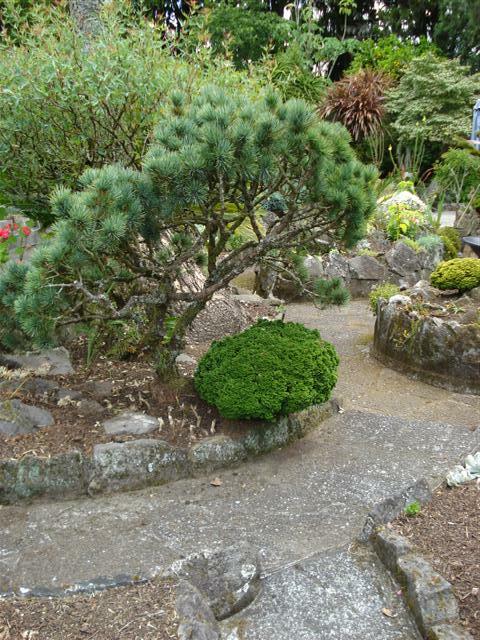 The basic rockery concept is to emulate the conditions of an alpine meadow. We can’t do alpine, though we have tried. We lack the winter chill and are a great deal too humid with rainfall evenly spread all year. Alpine meadows are cold deserts kept dry in winter by a coat of snow and ice. So our rockery plants are by no means traditional. No gentians or edelweiss here. But what it gives us is a section of garden which is highly detailed, where the pictures are small and individual and baby gems can be admired in close up view. It is entirely different to the big picture style of garden where form, colour and flow are what dominate. Bulbs rule in our rockery, especially those of a miniature or dwarf persuasion. We use cycads, venerable dwarf conifers and some smaller growing perennials so the area is not totally bereft of woody and herbaceous plantings but they are merely the backdrop. Best guess is that there are well over 500 individual pockets in our rockery. And the skill that has my gardening ability stretched to its absolute limit is the creation of differing combinations in at least some of those pockets. So one may contain nerines for autumn colour, moreas (peacock iris) for early spring and a small perennial such as a prostrate campanula for summer interest. I can not claim that I get triple layering in them all. I wish. Alas some will be bare during parts of the year because they are too small or I Iack the material or skills to plant in layers. But the structure provides the year round interest and does not demand to be filled to capacity twelve months of the year. Some bulbs will only flower for one or two weeks but in that time, they are the daintiest and most ephemeral of delights which would be lost entirely in larger garden beds. Mark’s parents both loved the rockery. Stepping out from the house, there is always something different to view. Day to day maintenance is relatively easy. We have always worked to keep it weed free, to restrict the occasional invasive bulb (it is why one has separate pockets to keep those with wandering ways in a confined area) and beyond the occasional light mulch and ongoing tidying, it is not generally labour intensive. With most of it being raised, it is not back breaking either. Many bulbs are happy to continue in an environment which is relatively poor. But there comes a time when the soil is so impoverished and compacted that treasures start to go back and thugs multiply so much that the competition is to survive, not necessarily to flower well. Bulbs are not gross feeders so we like to spread a thin layer of compost on top to mulch and give a light feed only. Not every plant is precious and that realisation has been wonderfully liberating. Some plants are past their use-by date. Some are just in the wrong place. Some have multiplied too well so there are too many of them. Going though centimetre by centimetre has been like a voyage of discovery. I have worked out that I can average about four square metres a day if I stick at it. With about 100 square metres of rockery, it is a mere 25 days work. Some people like to garden in containers to keep little treasures apart and to be able to give different conditions. Despite my current intensive effort, I think the rockery concept takes less work overall for more aesthetically pleasing results. Maybe the rockery will stage a fashion comeback. If the thought of assembling, placing and securing all those rocks defeats you, there is an alternative in what we call the carpet garden, but for more thoughts on that garden genre you will have to wait. This entry was posted in Abbie's column and tagged Abbie Jury, Abbie's column, growing bulbs, rockery on 15 January 2010 by Abbie Jury.